Voluntary simplicity is a philosophy. Often called compassionate living, it is a conscious choice to simplify your life and a deliberate downshifting to create the life and home environment that fit you and your family. Some people think that voluntary simplicity means frugality, but voluntary simplicity and frugality are actually two different things. Although frugality is an important part of voluntary simplicity, frugality is a tool that makes the simpler lifestyle possible… not the goal. Voluntary simplicity does not mean you have to live in poverty or practice a lifestyle of self-denial. It means quite the opposite, in fact, because once you develop the habit of being frugal where it really counts, you will be able to enjoy a happier and more meaningful lifestyle, with more discretionary money and time, plus the freedom of being able to decide what to do with both. Many people are tired of the consumerism and materialism that is “out there” these days. The constant round of needing more money to pay for more “things” locks some people into continuing on with jobs they hate and lifestyles that leave them feeling dissatisfied and unhappy. Many are looking for something, but they don’t know what. 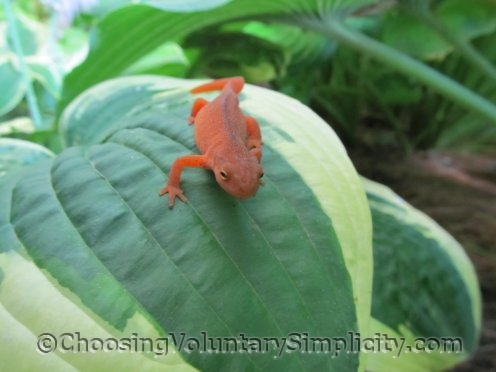 Voluntary simplicity provides an alternative… an opportunity to find balance in your life, connect with who you are, and create a lifestyle where you wake up each morning feeling a sense of fulfillment and excitement about the day ahead. 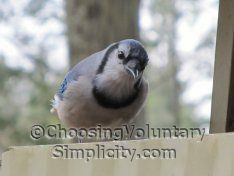 Choosing voluntary simplicity does not have to be a complete lifestyle change all at once. Making just a few small changes in your life can make a major difference. Start by limiting unnecessary purchases. Ask yourself if the item you’re considering is something you will still want a few years down the road… or if it really is something you want or need. If it’s just an impulse purchase, or you were going to buy it because it is the latest trend, maybe you would rather save the money or use it for something else that is more important to you. Think carefully about how you are spending your time. Is your life full of activities or scheduled events that are meaningless to you? Frugality of time is sometimes more important than frugality of money. Start doing things that bring you joy and stop doing some of those things that cause you to feel stressed and unhappy. Appreciate your family life and enjoy the people you love. Spend time with each member of your family and build strong relationships… make the effort to become a genuine part of each other’s lives. Do it yourself and become more self-reliant. Learn skills and teach yourself to fix things. Make a connection with nature. A short walk, time spent working in the garden, outdoor activities, or just being outdoors and enjoying the beautiful day that has been given to you can all bring amazing amounts of relaxation and peace of mind. Re-think the way you shop for groceries and the foods you eat. The old adage of “you are what you eat” is even more true today. Good nutrition… eating REAL food and a diet as free of preservatives and additives as is possible will help make you healthier and happier. Try to find a balance between work and relaxation. Everyone needs some downtime, both physically and emotionally. Voluntary simplicity is not a limiting lifestyle. Actually, choosing to live “consciously and deliberately” will give you freedom… more quality time… more discretionary money… and more appreciation and enjoyment of every aspect of your life. Just wanted to say that I enjoy reading the articles on your site. I have been trying to convince my family that this is the way to go, voluntary simplicity. I have made the change in myself over the last 4 months and I hope to try and infect my family with the happiness and peace of mind that I have found. Keep up the good work! David, many people tell me that their new happiness and peace of mind is so obvious that the rest of their family becomes more interested in simplicity as well. Hoping this happens with your family! This is all a wonderful introduction. This is still the best blog to use to get a sense of vol simpl basics. Thanks from everyone! I’m keeping your blog in the back of my mind to use as my ‘simplicity bible’ as such… I couldn’t even comprehend enough time to sit down and read through all your posts, but I know that any problem with any solution is likely to be right here when I need it! Thank you! All very sound and sensible stuff. Reclaiming what it means to be human rather than just being a worker / consummer automation seems to be coming into fashion, thank God. There may be hope for us after all! Oh, and Happy Thanksgiving. Being European I am not entirely clear in my own mind what Thanksgiving is (though the clue might be in the title), but have a good one anyway. I myself am a college student and somewhat limited as to the changes that are possible for me, but this blog has helped a lot! A year ago, as a lowly freshman, I joined in as other students rushed to outdo each other’s latest clothing or computer purchase, surviving on a diet of ramen and McDonald’s and beer, and wondered if there couldn’t be a better way. This year, armed with a summer’s worth of research, I can proudly say that I’ve found it! My apartment is more like a closet, my clothes are mostly thrift-store bargains, I don’t have a television, and I eat in more often than not- not to mention the total lack of beer in my mini-fridge- but my life is SO much less stressful! I can actually pay my bills! And afford more than ramen at the grocery store! Simplicity has become more than a philosophy in my life, it has become the key to the life I wanted to live. Thanks for the tips! Wonderful! It’s living life on purpose/intentionally, instead of just existing. Ah, this is wonderful sounds like the way of getting more . Will do some more fine tuning as time goes by.